Sérgio Sette Câmara was the quickest man of the second day of FIA Formula 2 pre-testing at Barcelona: the Brazilian set a blazing time of a 1:27.392 in the morning to head the overall session by 2 tenths over Nyck de Vries. Rookie Guanyu Zhou rounded up to the top 3. The track conditions were cooler than yesterday when the pit lane opened at 9am local time. Jordan King led the rest of the pack as soon as the lights turned green. Still on top form, de Vries set the early pace in a 1:28.922, two tenths quicker than second placed man Luca Ghiotto. 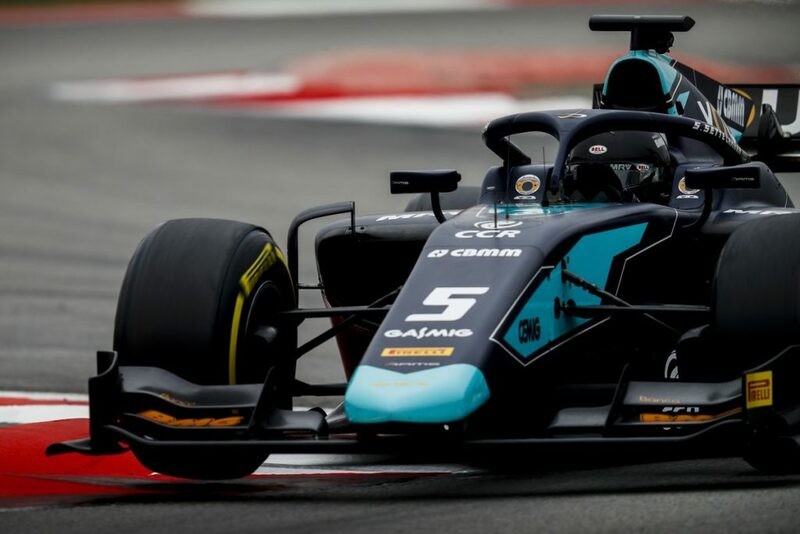 Nicholas Latifi put his DAMS car on top with a laptime 4 tenths better than de Vries’ until the proceedings were halted after Juan Manuel Correa stopped at Turn 8. At the re-start, the Dutchman from ART Grand Prix reclaimed P1 whilst Zhou moved up to P2 with a time 0.015s slower than de Vries’. Ghiotto found some extra pace to go quickest, but de Vries broke the 1m28s barrier, and so did Zhou who reclaimed second behind the Dutchman. Halfway through the session, Mahaveer Raghunathan came to a halt at Turn 15 thus bringing out a red flag. Another stoppage occurred shortly after the re-start following King going wide at Turn 3. Thirty minutes before the chequered flag, Sette Câmara clocked in a 1:27.392 and his time would not be bettered. The running was interrupted one final time after Mick Schumacher stopped on track at the exit of the pit lane. Sette Câmara sat pretty at the top of the timesheets by the end of the morning session ahead of De Vries, Zhou, Louis Delétraz, Ghiotto, Schumacher, Latifi, Callum Ilott, Nobuharu Matsushita and Sean Gelael. After the lunch break, Jack Aitken hit the track first, but it was Matsushita who set the pace in a 1:29.476 ahead of teammate Delétraz. In the opening hour, Correa moved up to P2 with a time +0.079s slower than Carlin’s Japanese driver. The studious afternoon was halted only once: forty minutes into the session Nikita Mazepin span and stopped at Turn 4. In the closing stages, Ralph Boschung dipped under 1m29s to go top ahead of Roberto Merhi who also improved with less than 20 minutes left on the clock. At the chequered flag, behind Boschung and Merhi, Matsuhita, Correa, Delétraz, Ilott, Raghunathan, Anthoine Hubert, Aitken and Gelael completed the top ten. The final day of pre-season testing will commence tomorrow at 9am local time.